No. 318 Squadron Part 2. "Italy"
No. 318 Squadron Picture Gallery. Part 2. Left: F/O Buckiewicz. 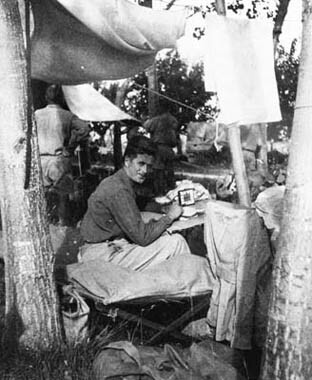 During their frequent relocations, squadron's member often lived in quite primitive conditions. Right: ?. From left: Ignatowski, Turek, Uchwat, ? and Buckiewicz. LG207 Trigno. Early May 1944. 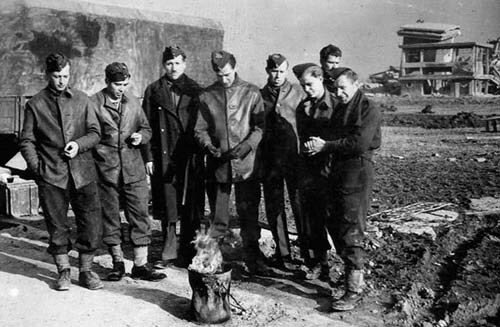 Pilots and other personnel of No. 318 Squadron. 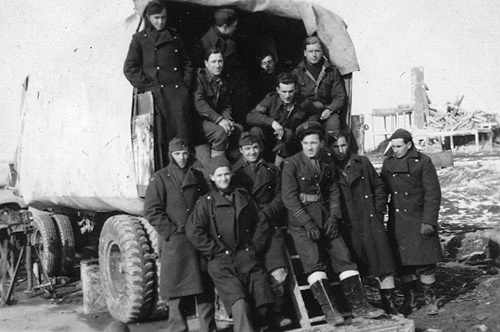 Back row from left: ?, Radwanski, Ignatowski, Buckiewicz, Karlikowski, Schreiber, ?, Tatarski, ?, Gaworski, Michniewicz, Zielinski, Kalita, Gorniak, Paczuski, Galicki, Kesserling. Middle: Kon, Thorpe, Wisniowski, Barclay (Austalian), Wielochowski, Rayski, Moszynski, ?, Narzymski, Sharp, Preihs, Kalinowski. Front: ?, Chelminski, Bartkiewicz, Gadomski, Sep-Szarzynski, Kraszewski, Tate. 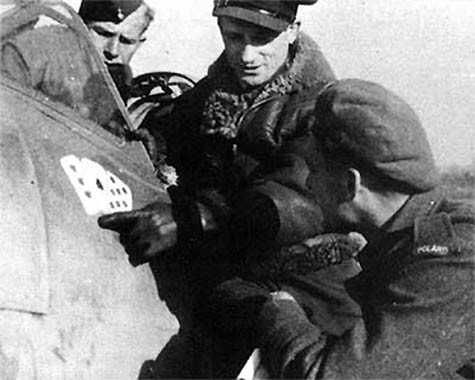 Left: Pointing at the logo is F/O Mieczyslaw Galicki. Supposedly, he was the author of that logo. Right: F/O Hamankiewicz. Does his gesture imputes lack of privacy? Neahh! Trigno. Officers mess. I always wondered how often officer caps fell off when they tripped up on those lines and pegs. Trigno. May 1944. Flight "A" with mechanics. Left: Trigno. May/June 1944. 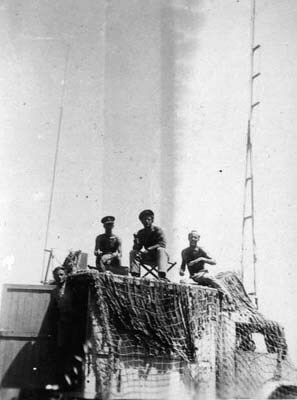 The lack of control tower forced the unit's signal officer to improvise, and the top of a radio tender provided good observing post for a ground controller. 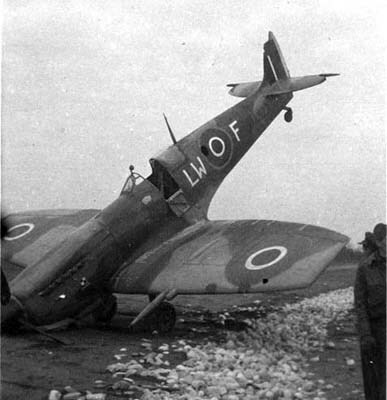 Right: Sgt Ostrowski's prang. 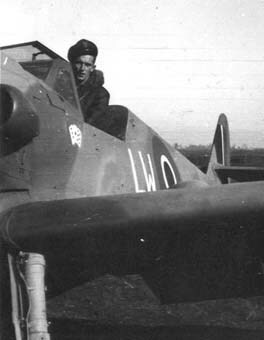 Although initially the squadron comprised exclusively officers, after the end of the war at least two new pilots were sergeants. 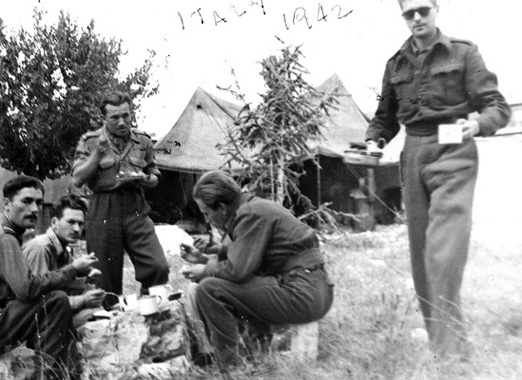 Above and below: Treviso, May 1945. Grassy dispersal with the unit's Spitfires MkIX. 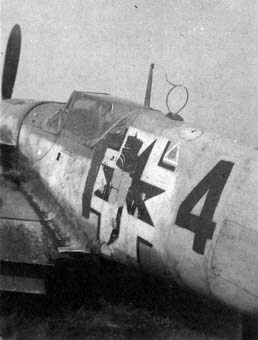 Part of the squadron's booty in Italy was this Bf109, which for a short time became its 'hack'. Read its story. 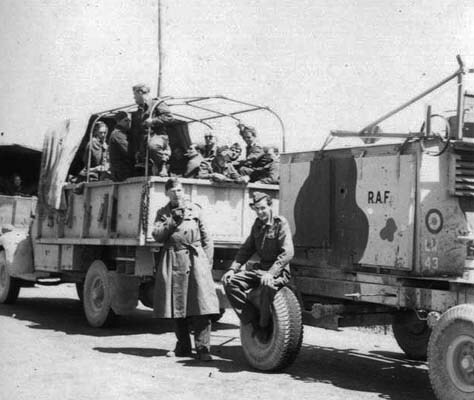 Envied by other units, was also the squadron's superbly equipped motor transport, complete with mobile machine shop, generators, aircraft recovery vehicles, radio tenders etc. Left: Reportedly a flyable value of two bottles of whisky. 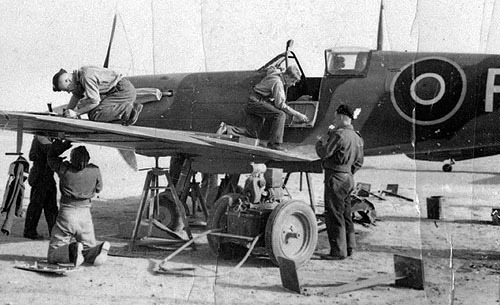 Center: The same aircraft before the paint job at 318. 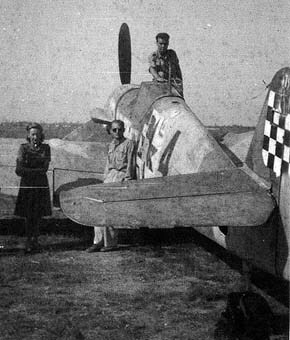 Right: P/O Stramik, in a freshly painted Bf109. He flew that a/c to the squadron. Only few flights were made on it, as its engine quickly gave up after catching up fire on three consecutive start-ups. All three photographs were taken with Jozef Krzywonos private camera. Tissano, July 1945. "Why not? ", LW-L and its crew. 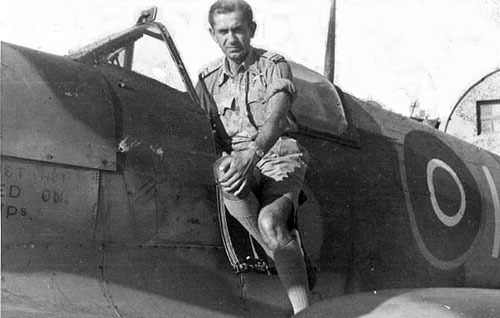 In the cockpit is P/O Chudzinski. 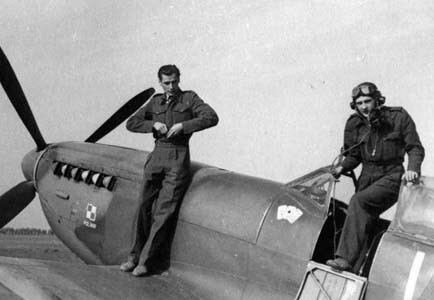 Left: F/Lt Krzywonos and P/O Guziak in cockpit. 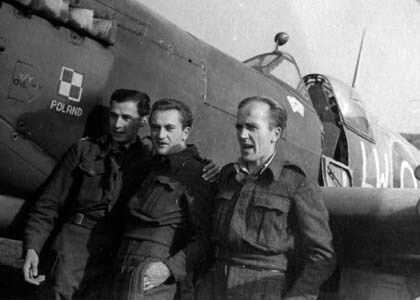 Right: Krzywonos (left), Guziak and Sgt Ostrowski. 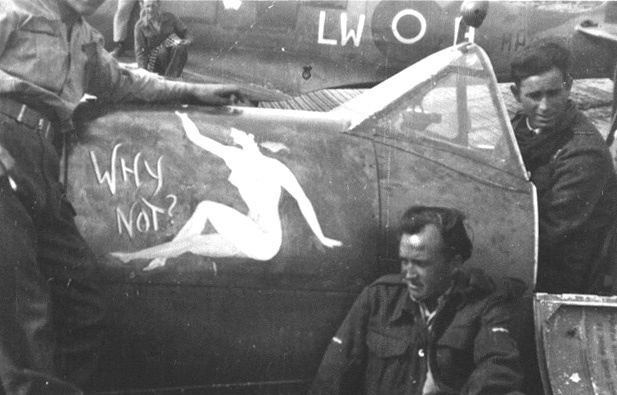 Squadron are not only the pilots. It couldn't operate without numerous ground personnel. Below pictures showing some of those from No. 318 squadron. During one of the frequent relocations. On the road to Tortoretto. 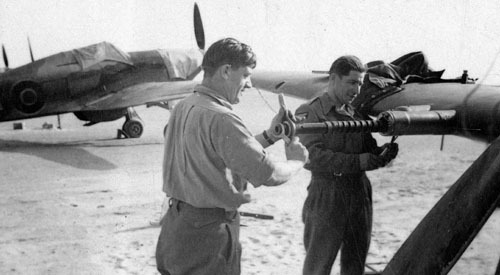 Left: F/Lt Krzywonos (sitting on a wheel), the squadron's signal officer with his unit and part of its equipment. 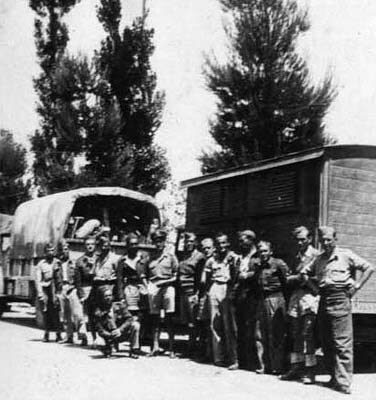 Right: Part of the squadron's road party. 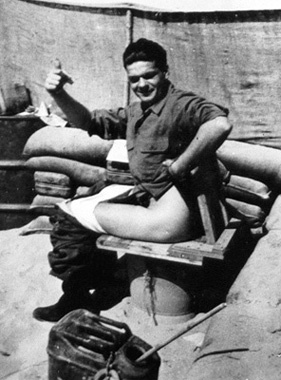 Rimini, early November 1944. 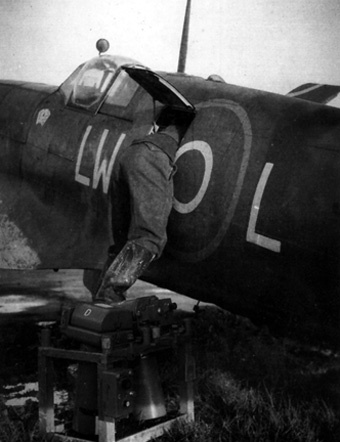 Armourers and fitters at work. 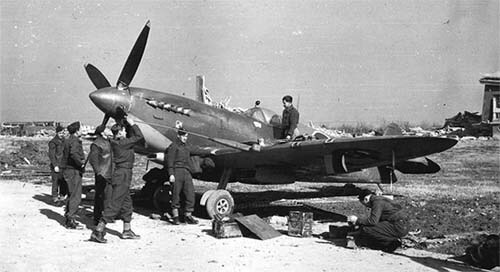 Rimini, early November 1944. The squadron's radio unit. Forli, January 1945. Duty Officer, F/O Uchwat with a group of ground crew. 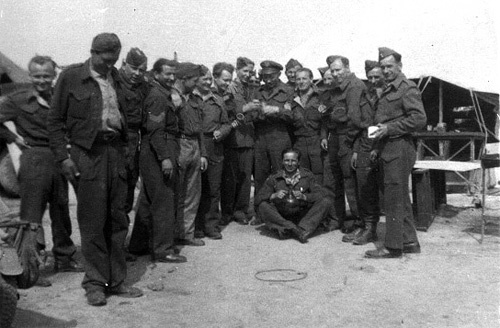 Group of the 318 ground crew at Forli in March 1945. Needs info.